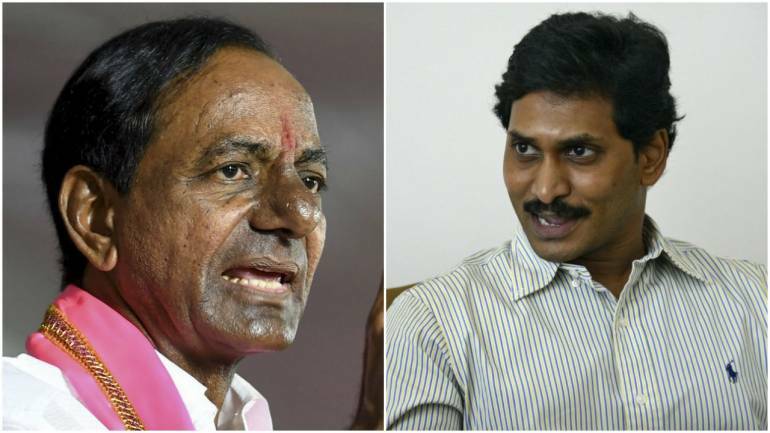 YSR Congress chief Jaganmohan Reddy Wednesday welcomed TRS chief K Chandrasekhar Rao’s efforts to form a non-BJP, non Congress Federal Front, saying it was necessary for regional parties to unite to highlight the ‘injustice’ done to them. He said this at a joint press conference with Rao’s son and Telangana Rashtriya Samithi working President K T Rama Rao after initial talks were held between the two parties. “We welcome the initiative. In order to protect the rights of the states, there is a necessity to increase the number (of MPs from regional parties in Parliament) and for regional parties to unite. The proposed national platform mooted by KCR, where all states (regional parties) can come forward with substantial number of MPs, can highlight the injustice being done to the states. For further discussions, KCR will come and meet me at a later stage. We will discuss at length within our party on how to take forward this in future,” Reddy, the leader of the opposition in the Andhra Pradesh assembly, said. Rama Rao confirmed this, saying his father would soon leave for Andhra Pradesh to hold talks with Jagan Mohan Reddy. “KCR garu (KCR) earlier visited various states and held discussions with regional parties and leaders and Chief Ministers. Very soon he will visit Andhra Pradesh to meet Jaganmohan Reddy. He will discuss all the issues with him and move further,” he said. Rao expressed confidence that like minded forces, who believe in strengthening regional parties and states, would come together. On Special category Status for Andhra Pradesh, Reddy RPT Reddy said that the promise made by the earlier governments would have been fulfilled had there been support from more number of MPs. Reiterating his support for SCS to Andhra Pradesh, Rama Rao said that his party had time and again demanded that the Centre confer the status to the neighbouring state. KCR, as he is popularly known, had met Trinamool Congress (TMC) supremo and West Bengal Chief Minister Mamata Banerjee on January 10 as part of his renewed efforts towards forging a ‘non-Congress, non-BJP’ federal front of regional parties. Rao had also met Odisha Chief Minister and Biju Janata Dal (BJP) chief Naveen Patnaik and Karnataka Chief Minister H D Kumaraswamy, seeking to drum up support for the front. Reacting to the meeting, AICC spokesperson Sravan Dasoju said the two ‘political opportunists’ came together to protect the larger interests of BJP.”The Federal front is a facade of Narendra Modi. YSRCP is a party which has opposed tooth and nail the formation of Telangana. And it is dubious on the part of TRS to say that YSRCP will be helpful in the development of Telangana or mutual development,” Sravan told PTI. He alleged that TRS and YSRCP are protecting their mutual business interests and that of BJP.